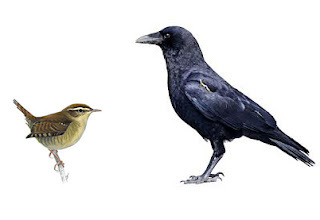 THE Crow once caught the Wren, and said to her, "I will eat you now. ' The Wren wailed to herself "oh, my little daughter, my little daughter, who will look after you when I am dead?" The Crow thought to himself, "This Wren is old and tough, but her daughter will be young and soft, 'and so he suggested to the Wren, I will let you go if you will promise to give me your daughter to eat on the seventh day from now.' The Wren promised and the Crow let her go. On the seventh day, the Crow came to the Wren asked for her daughter. "You eat all sorts of rubbish," said the Wren your beak is dirty. My daughter is clean and sweet, and unless you wash your mouth in front of me, I cannot put my daughter in your beak. "All right," replied the Crow, "I will come back. with some water. ' Then he flew away. The Water replied, "How can you take me away without a pot? So, go and get a pot first." "All right," said the Crow, and flew away. "I am willing to come replied the Mud," but I am too hard to mend the Pot. So please ask some buffalo to come and wallow here. "I am willing to come replied the Buffalo," but I am too weak with hunger to wallow. Please get me some grass to eat. " "I am willing to come replied the Grass, but the Buffalo is such a big eater, and he needs more of me. If you can give me some fresh land, I will grow more until there is enough of me for the Buffalo." To eat the little Wren, "
"I am willing to go away," replied the Forest, "but I cannot move, as the roots of my trees are stuck in the ground. If you will please fetch a fire, and bum me up, the Land will be cleared". All right, "said the Crow, and flew away. The Crow then went to the Fire and said:"
"I will come replied the Fire. The Crow in great joy flew back towards the Forest with the Fire in his beak, but before he could reach it, his beak had become so badly burned that he had to drop the Fire. Giving up all hope of eating the little Wren, the Crow flew home in disgust.